Do you guys ever do this? Sometimes I just take a pack of meat out to thaw and then decide what to make with it later. After a very chicken-heavy week it seemed time to mix things up with a little ground beef — and since I’ve also been dealing with this lovely upper respiratory/sinus thing all week, it also seemed time for a little spice. Although my first thought on a cold day was chili, I also wanted to incorporate some baby spinach… so eventually landed on the idea for these Korean Style Ground Beef & Spinach Rice Bowls. 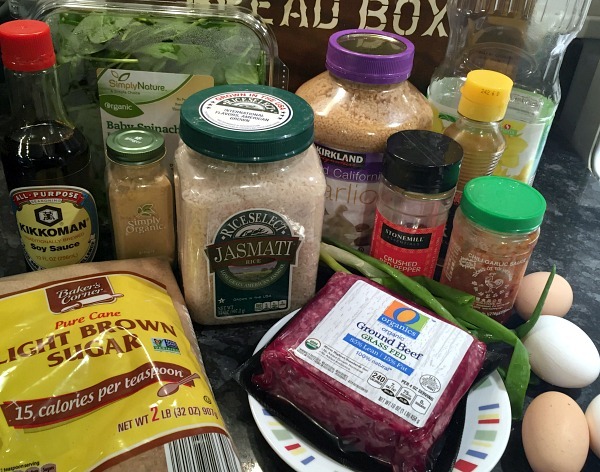 This basic recipe for Korean ground beef and rice bowls is floating around in a virtually identical format on multiple sites, but it looked a little too sugary for me — so I decided to mash it up with the recipe for bibimbap over on Budget Bytes to create my own take on Korean ground beef & spinach rice bowls. I used chili garlic sauce (because again, I wanted mine on the slightly spicier side), but you could also use Gochujang or Sriracha to good effect. Top everything off with a runny fried or soft-boiled egg, and you have yourself some comfort food in a bowl! I spy with my little eye through my blue glass bowl…! Start rice cooking (if not using leftover rice). Heat canola and sesame oil in a large skillet over medium heat until shimmering and swirl to coat the pan, then add garlic and saute for just a few seconds. Add spinach and crushed red pepper, then continue sauteing over medium heat until spinach is wilted and dark green, stirring occasionally. Remove cooked spinach from the pan to a separate bowl. Add ground beef to the same pan you used for the spinach, brown and crumble it over medium-high heat until cooked through, then drain. Stir in soy sauce, brown sugar, ginger, sesame oil, and Gochujang. Reduce heat to medium-low, stir, and simmer for another couple of minutes to blend the flavors. While finishing up your beef, fry four eggs sunny side up in a little canola oil in a separate pan. 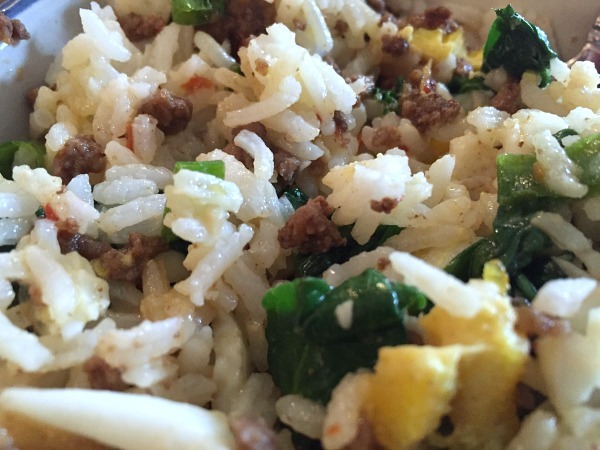 Divide cooked rice evenly among four bowls and top each bowl with beef, spinach, egg, and green onions. Mix up your bowls and enjoy. Serve with additional Gochujang, Sriracha, or chili garlic sauce, if desired. 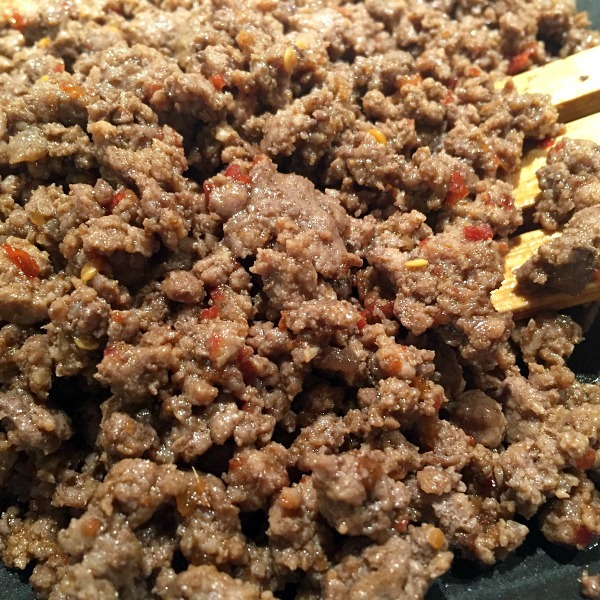 Note: Adjust proportions on the soy sauce, brown sugar, and spicy sauce to taste depending on if you prefer your beef spicier, sweeter, or saltier. Note also that Gochujang and Sriracha have an underlying sweetness, while chili garlic sauce does not. So much flavor, and so satisfying! 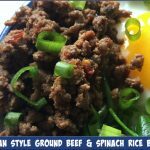 These Korean style ground beef & spinach rice bowls make for a super easy weeknight dinner that can be on your table in about 30 minutes, and a nice alternative to common ground beef dinner staples like tacos, spaghetti, or chili. You can also easily make them gluten free by substituting gluten free soy sauce or tamari. A note on ingredients: If you usually shop ALDI and/or follow my ALDI meal plans, you’ll know that ALDI carries neither sesame oil nor chili garlic sauce (although they do sometimes stock Gochujang and Sriracha). Both of these are great ingredients to have handy in your pantry, however; they last forever, and just a little bit of either adds so much flavor to any number of dinners. Pick up your chili garlic sauce and sesame oil at a larger grocery store, produce store, or even at Target or Walmart. See more here on suggested pantry staples. 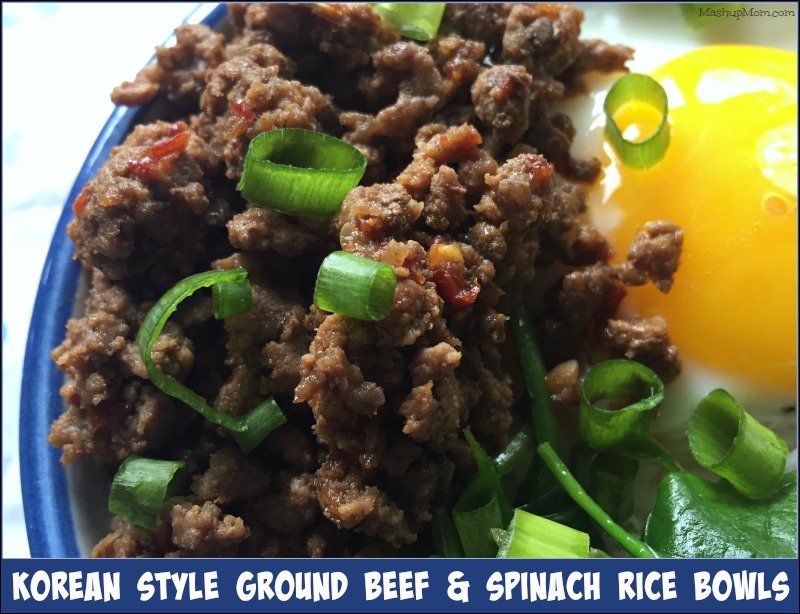 This flavorful, budget-friendly, all-in-one, 30-minute meal idea uses just one pound of ground beef to feed four (when bulked up with the rice, eggs, and spinach). Start rice cooking (if not using leftover rice). Heat canola and sesame oil in a large skillet over medium heat until shimmering and swirl to coat the pan, then add garlic and saute for just a few seconds. Add spinach and crushed red pepper, then continue sauteing over medium heat until spinach is wilted and dark green, stirring occasionally. 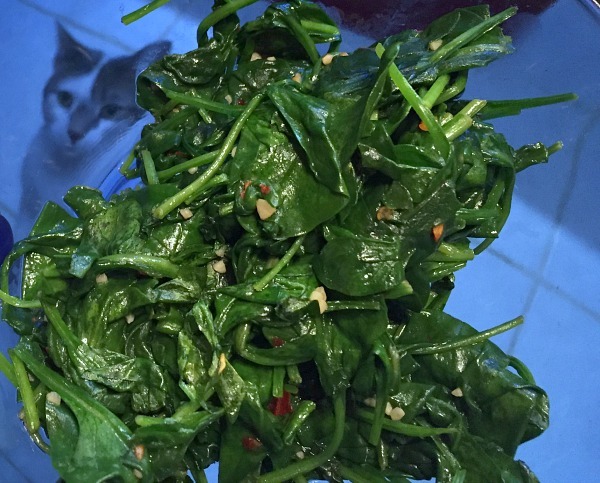 Remove cooked spinach from the pan to a separate bowl. Add ground beef to the same pan you used for the spinach, brown and crumble it over medium-high heat until cooked through, then drain. Stir in soy sauce, brown sugar, ginger, sesame oil, and Gochujang. Reduce heat to medium-low, stir, and simmer for another couple of minutes to blend the flavors. While finishing up your beef, fry four eggs sunny side up in a little canola oil in a separate pan. 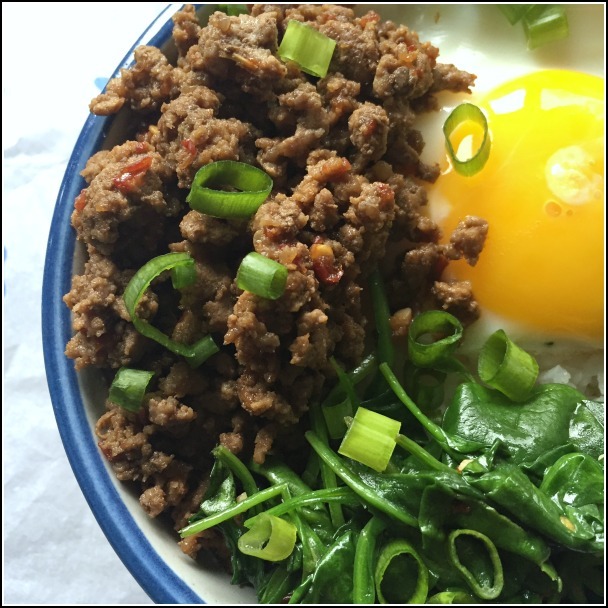 Divide cooked rice evenly among four bowls and top each bowl with beef, spinach, egg, and green onions. Mix up your bowls and enjoy. Adjust proportions on the soy sauce, brown sugar, and spicy sauce to taste depending on if you prefer your beef spicier, sweeter, or saltier. Note also that Gochujang and Sriracha have an underlying sweetness, while chili garlic sauce does not. We love these flavors. Mmm, gochujang. I think we’ll have to try this soon. That looks amazing. Can’t wait to try it. Has anyone tried this with ramen noodles instead of rice? Made this last week for dinner, and it was amazing! I cut back on the Sriracha since my 12 & 7 year olds were eating it too. Hubby just added extra to his bowl. My 12 year old declined a fried egg, but loved everything else. @Rebecca – I bet this would be great with noodles! Do you use toasted sesame oil or plain? I can’t tell in the picture. Also is Sriracha or Gochujang hotter? This sounds and looks really good. I used toasted! It was fabulous! I used plain sesame oil. Sriracha and Gochujang are similar in spice levels — Sriracha is a little garlickier and tangier and Gochujang is richer and saltier. Omg! That is all I have to say! This was one of the BEST dinners! Definitely keep this in the rotation with the weekly dinners??. It was delish!! Thanks for sharing!! Absolutely delicious! Just the right blend of ingredients for the flavour. I used lightly steamed silver beet as I didn’t have any fresh spinach but it was still scrumptious. It was a tad too spicy for my husband’s heartburn although he enjoyed the flavour, and I added spoonfuls of chilli garlic paste to mine just like I used to with my Bi Bim Bap in Korea.